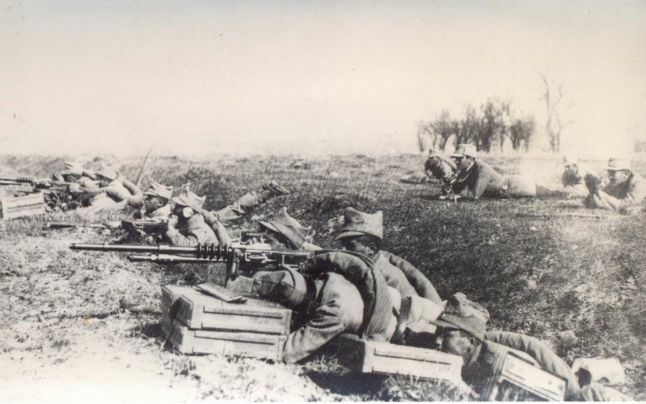 With the reorganization of the units, their endowment and accommodation to new fighting techniques, the confidence and the morale of the Romanian soldiers began to gradually increase in the spring of 1917. The remnants of the army that managed to retreat to Moldavia were divided into two. The Second Army comprised six divisions and it remained on the battlefield in the Vrancea region, being settled between Russian army units. The rest of the divisions were taken to the back of the front, in northern Moldavia for reinforcement and reorganization. These units would the building blocks of the First Army. But in order to organize and rebuild the army, it took several weeks for the scattered, starved and frozen soldiers to be assembled in Moldavia and sent to the reorganization areas. This ended only at the beginning of February 1917. Infantry received the most attention in organizing and training. The infantry regiments were reconstituted in three battalions of four companies each, one of which was equipped with eight machine guns. The companies had a smaller number of men than in 1916, being comprised of 180-190 men instead of 260. Although it had smaller numbers, it benefitted from higher fire power than the same units of 1916. Thus in 1917, each regiment had 24 machine guns, 96 automatic rifles, and almost all soldiers had grenades. If in 1916 the Romanian army was equipped with grenades that were very hard to handle, in 1917 the Romanian soldiers received hand grenades from France, which were very easy to use by the Romanian soldier. Romanian officers and soldiers also received metal helmets, bullet protectors and breathing masks to protect themselves from the asphyxiating gas used by the enemy. Training centres were created next to each division headquarters. In Bacău, where the Second Army’s headquarters was located, a large training centre was set up, through which all soldiers passed before they reached the front. A school for field fortifications was set up in Huși, where commanders of regiment brigades and general staff officers were trained. Numerous conferences were held with division commanders. The individual instruction was followed by military exercises with combined arms and large operational unit. With the reorganization of the units, their endowment and their accommodation to new fighting techniques, the confidence and the morale of the Romanian soldiers began to gradually increase. The tough conditions that they and the country were going through slowly and surely cemented in their minds that the interests of the country and of the population are identical and are closely related to victory. The improvement of the equipment was also felt by the Romanian soldier. Moreover, it allowed the application of new tactics, with a focus on fire power. Instead of assaults executed by infantry without any support, artillery, machine guns and automatic rifles would play a definitive role in subsequent combat operations. Perhaps even more important was the role played by King Ferdinand in those dramatic moments when he promised that: “To you, sons of farmers, who defended with your bare hands the earth where you were born, where you grew up, I, your king, am telling you that besides the great reward of your victory, that ensures the gratitude of our entire nation, you have also gained the right to master the land you have fought for. You will be given land. I, your king, will be the first to give an example. You will also be given broad participation in the affairs of the state”. This was the message that would turn the defeated Romanian soldier of 1916 into the soldier who had nothing to lose, but on the contrary, everything to gain. It was the formula by which patriotism gained real value and was accessible to all soldiers. The rising morale of the Romanian troops after reinforcement and reorganization was also felt by Russian General Monkevitz, Chief of Staff of the Fourth Russian Army on the Romanian front. He described the sad situation of the Russian troops in relation to the Romanian ones in the summer of 1917: “Among the Romanian regiments, that were preparing to attack at the same time as ours, things were going rather differently. A great warlike ardour emboldened the reinvigorated and strengthened army: the officers and soldiers were eagerly waiting for the battle, to avenge their uninterrupted failures, and liberate the invaded territory”. Among the dangers that faced the Romanian army in the spring of 1917 was the revolutionary virus that griped Russia and the Russian army. Fortunately, the Romanian army proved to be immune. However, Russian military strength gradually declined, and this would have widespread repercussions on Romania, which in the summer of 1917 was preparing for a major offensive to wash away the shame of the 1916 campaign.